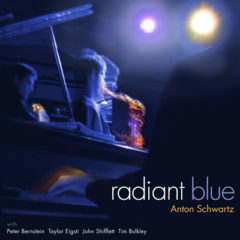 Radiant Blue could make an excellent introduction to jazz for someone on the outside looking for a way in. Because it is based on the blues, it is accessible. And because tenor saxophonist Anton Schwartz and his capable sidemen are deadly serious about their fun, there is enough musical substance here to make sure the jazz neophyte is exposed to the real thing. Those sidemen are guitarist Peter Bernstein, pianist Taylor Eigsti, bassist John Shifflett and drummer Tim Bulkley. They are all adept at staying in the pocket while stretching it. As for Schwartz, he has a classic clear-throated tenor sound and kicks like a mule. His zeal to communicate is fervent yet sophisticated. Some of Schwartz’ blues grooves and melodies (“Phantom Dance,” “Blues for Now”) sound generic (although carried off with flair). More often, his tunes reveal the vast variety of emotional and intellectual content that can be expressed in the 12-bar-blues form. “Marcel Marceau” is music about silence, full of spaces. “Life & Times” is a floating suspension that eventually (powered by Eigsti) takes off and flies. A blues concept of Jobim’s “Wave” goes through a similar pattern, where the intensity sneaks up on you. Those aforementioned neophytes with DVD-Audio capability in their systems should go for the high-resolution special DVD-Audio edition of Radiant Blue.